The CDH-37 model has been discontinued. Please see the CDH-SD1 as a possible alternative or contact our Flow Engineering Department. The CDH-37 portable conductivity meter provides excellent cost-effective performance in a field unit that measures ionized materials in solution. Housed in a rugged, high density polyethylene protective case, the CDH-37 includes a break-resistant probe with an internal thermistor for automatic temperature compensation. 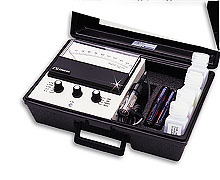 The unit features 5 conductivity ranges from 0-2 µmho/cm to 0-20,000 µmho/cm, to cover most water applications. To ensure versatility, the CDH-37 operates on 8 AA batteries and comes complete with probe and standard solutions. 참고: Unit supplied as a complete kit. Includes meter built into rugged carrying case, conductivity cell, conductivity standard solutions, 8 AA batteries and manual.